There are many ways a homeowner can enhance the exterior of their home. Whilst many people choose gardening as a hobby, this can be too time-consuming for many. For those who want to add a touch of character to the outdoor area of their home but don’t have the time or motivation to take up gardening, there are a number of alternative options. 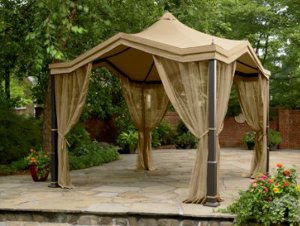 The addition of a garden canopy is one such way they can do this. It’s a common misconception that canopies are restricted to doors and windows. As a matter of fact, there are actually a variety of outdoor garden canopies to choose from and lots depends on whether you want a permanent solution or something that can be brought out and put away when you please. Only you can decide which fixture is the best choice for you, and a lot is dependent on what you want to use the canopy for. You may get on really well with your neighbours, but nobody’s perfect and a bit of privacy is good for everyone from time to time, right? You may be relaxing in the garden, in your own world with your head buried in a book when all of a sudden, your neighbour comes and starts asking if you watched last night’s football game. With a retractable canopy, you have the best of both worlds. You are able to choose when you’re free for the neighbour to partake in small talk over the garden fence, and can also send a subtle message when you don’t wish to be disturbed. Another advantage of warm summer days is the opportunity to eat meals outdoors. Unfortunately, we all know how unpredictable the weather can be and the weatherman can’t always get it right. A canopy in the garden can put these concerns to bed and make sure you eat your meal in comfort without one eye on the sky. A remote controlled retractable canopy can make sure you don’t have to get up and disrupt your meal if the worst does happen. As well as convenience, health should also be taken into account when it comes to the garden. Whilst the sun is a welcome addition to most days, too much exposure comes with obvious health risks. All experts recommend a break from long sunbathing sessions, but if you don’t want to go inside then a canopy allows you to sit in shade. This way you still get the heat but aren’t exposed to potentially harmful rays. Choosing the right canopy can also help when it comes to retaining furniture. Patio and French doors, whilst looking good, expose furniture indoors to lots of light and over time could cause the furniture colour to fade. Choosing a lightly coloured canopy will help reflect harmful rays away from the people sat under the canopy, and also away from the windows which could cause damage to furniture. 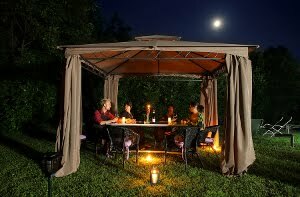 These are just a few tips to buying and utilising a garden canopy. They can add some distinction to a home with minimal effort and fuss, and can be used for a variety of other reasons, such as a workspace or just a smoking shelter for smokers who are forbidden from doing so in the home. Jack Oldham is a journalism graduate who enjoys blogging about home improvement, sports and music.